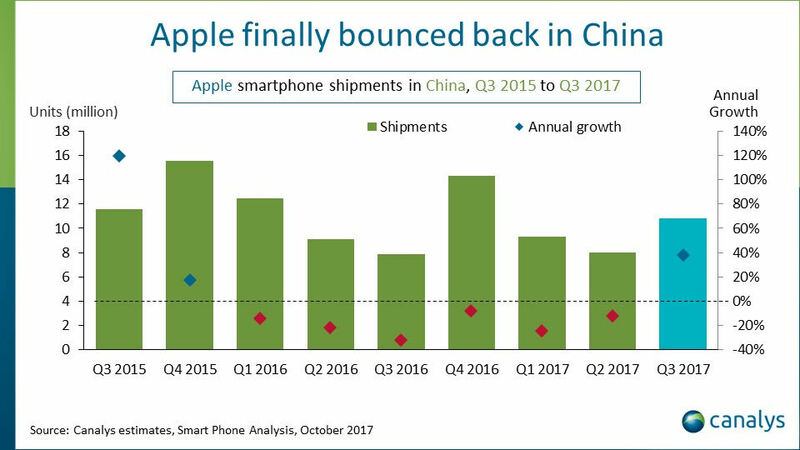 Analyst firm Canalys reckons Apple’s smartphone fortunes in China are improving after six consecutive quarters of decline. Chinese iPhone shipments apparently increased by 40% year-on-year, hitting 11 million in Q3 2017, although it should be noted that Apple has yet to formally announce its shipment and revenue numbers for the quarter. Canalys warns, however, that this upturn in Apple’s Chinese fortunes could be fleeting. “Apple’s growth this quarter is only temporary,” said Mo Jia of Canalys. “The high sell-in caters to the pent-up demand of iPhone upgraders in the absence of the iPhone X. Price cuts on earlier models after announcing the iPhone 8 have also helped. However, Apple is unlikely to sustain this growth in Q4. The Canalys Apple China numbers are below, followed by the year-on-year comparison for the top five Chinese smartphone vendors. As you can see the company reckons overall shipments declined by 5% in the country, but at the same time four of the top five vendors experienced substantial increases. Xiaomi looks like it shipped around 16 million for the quarter, taking the total for the top five to 91 million – 76% of the total. Canalys says total shipments fell by around 6 million, but the top five increased theirs by around 14 million, meaning the long tail must have dropped a whopping 20 million shipments annually – around half its likely previous total. To sanity-check these numbers we asked Neil Mawston at Strategy Analytics for a second opinion. 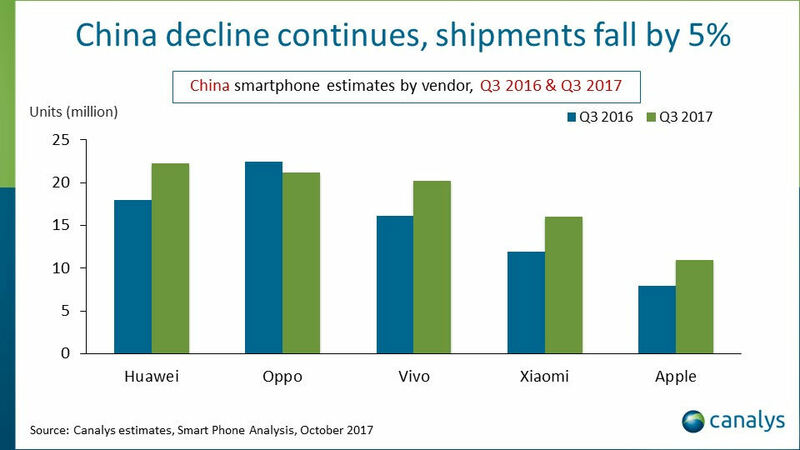 He hasn’t come up with his Q3 numbers yet – quite sensible since the vendors haven’t either – but he did say this: “We provisionally model China at 0% YoY growth (zero) for 121 million smartphone shipments in Q3 2017.” So opinion is divided, but that long-tail drop-off still seems odd. Canalys thought it might as well have a crack at India while it was at it, which seems to be the engine room of global smartphone growth these days, following the sudden decline of the Chinese long tail. 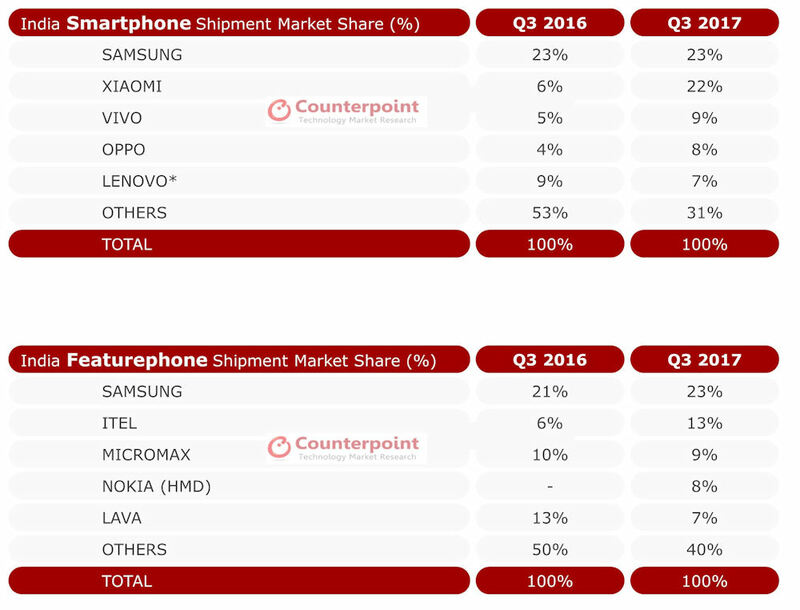 There we’re seeing healthy growth of 23%, driven largely by Chinese vendors, although Samsung is clinging onto top spot. 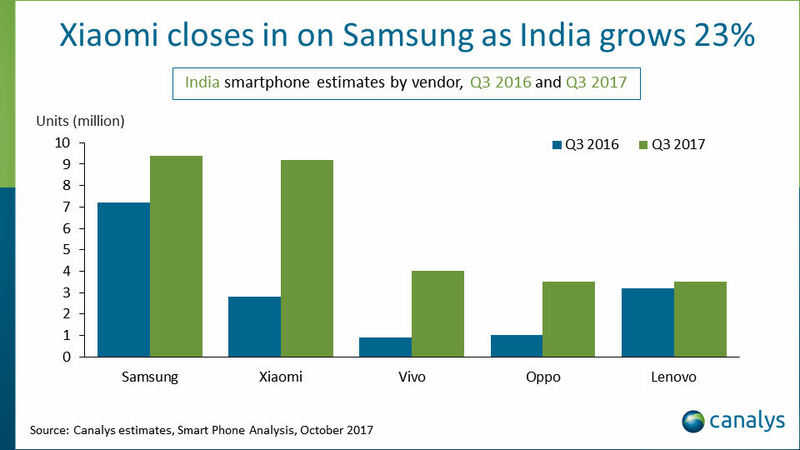 There seems to be more consensus on India than there was on China, with analyst firm Counterpoint publishing a pretty equivalent set of numbers, although they’re also still keeping an eye on its featurephone market. Both firms also agreed that India overtook the US to become the second biggest smartphone market in Q3. Reliance Communications rumours are continuing to swirl after a weekend of adverts and offers to lure customers away from the troubled telco. The telco has been in a bit of trouble for a while as debts continued to pile up (supposedly in the region of $6.8 billion), and it would seem the attempted acquisition of Aircel could be the final roll of the Reliance Communications dice. Chairman Anil Ambani had promised cash reserves at Aircel would provide a more stable foundation for Reliance Communications, but both parties seemingly got sick of endless delays, abandoning any deal. And the smell of blood has made its way to the noses of the cut-throat competitors; apparently the scavengers can’t even wait for the limping giant to die; the steaks are being carved out already. This weekend saw Bharti Airtel launch a number of adverts welcoming any Reliance Communications customers to their ranks, and Vodafone launch a referral scheme, promising a £1.50 kickback to any of its customers who can tempt family and friends into their ranks. While Airtel and Vodafone are already tucking in, Jio has been relatively quiet. Perhaps this is a bit of family respect, although we understand Anil and Mukesh Ambani aren’t exactly best mates, or maybe it has something to do with a bit of acquisition in the future. With one brother on the up and the other finding issues in the telco space, some have might believe Reliance Communications is an acquisition target for Jio. This does kind of make sense, as Jio has not exactly created a reputation for being considerate to competitors. It was after all Jio’s aggressive pricing strategy which was the beginning of all the pain in India. Unfortunately for some, they were not able to live with the pace of change. Telenor withdrawing, Vodafone and Idea merging and Bharti Airtel grabbing Tata Teleservices, demonstrate the consolidation trends. Reliance Communications was supposed to contribute in a more positive manner by buying Aircel, but it could be on the worse end of the deal. Just to be clear, a Jio acquisition has not been confirmed in any way shape or form, and our sister-site Light Reading reported Reliance Communications would close most of its wireless business over the next month. Apparently, most employees have been told November 30 would be their last day, and the company’s DTH license will expire on November 21. The decision has already been made not to renew this licence. In days gone, Reliance Communications was known to have a fairly successful 3G-dongle offering, though with the industry moving towards 4G and competitors carving into this niche, the telco has struggled. Reliance Communications has already said 4G is going to be the primary focus as “irrational pricing by all industry participants have destroyed profitability of traditional 2G/3G mobile business”. The team can complain about the underhanded nature of competitor moves if it wants, but situation is actually very simple; the industry changed, Reliance Communications didn’t, and now it is no longer competitive. The only question which remains is what will happen to the remaining business and its small operations in the 4G space. With Bharti Airtel and Vodafone already picking away at the rotting remains of the Reliance Communications customer base, an acquisition from one of these vultures seems unlikely. Or maybe the business will find more favour in the 4G world and continue to operate on its own? Reliance Communications has preached about a 4G-focused strategy which would optimize its spectrum portfolio, eliminating the loss-making aspects, but something needs to change. The business is not competing with the new Indian heavyweights, and the pressure of debt looks to be swelling. Perhaps a family reunion is the most realistic chance Reliance Communications will continue to be, otherwise it will likely be a continued erosion to non-existence. We all knew YouTube was a big thing on mobile, but Google has said it’s starting to get big on our TVs. This would certainly be a big of a coup for the ‘do no evilers’, who seemingly aren’t content mopping up advertising revenues online; the TV is next for YouTube. It has been an option for a while on smart TVs, but few people have seemed to take notice. But not anymore. YouTube is growing in our living rooms. What a bit of business this has turned out to be for the Googlers. Back in 2006, Google decided to acquire YouTube for $1.65 billion; a decade ago this sounded like an astronomical amount of cash, but now it is looking like a bargain. Back then, it was the premier place to watch clips and user generated video, and to be fair to Google, it still is. Some businesses would have bought it, figured out it couldn’t be monetized, and left it to carry on the status quo. Another service would have been launched, and that would have been the biggest and the best video platform today. But Google continued to invest and create a better experience for customers, and now it has an offering which looks like it could begin to generate some serious revenue. Alongside all the advertising revenues which will be collected in the background, Pichai is pretty confident in the progress and projections of its subscription model as well. YouTube Red will deliver 40 original shows this year, and YouTube TV. The live TV subscription service, now covers two-thirds of US households and is available in 15 metro areas. YouTube TV is still in its early days, though Pichai is attempting to bring the Google ethos into the content market; simplicity. Google has made it incredibly easy to find anything online, many forget how difficult search engines were to use prior to Google. If this could be done to content, a lot of people might start to get interested. A couple of weeks ago, Telecoms.com attended IBC in Amsterdam and one of the discussions was how to make sense of all the content which is out there. There are so many windows, and gateways, as well as different types of content, finding what you want to watch is becoming a monstrous task. Ericsson brought out research recently which also highlighted the amount of time we spend browsing content is increasing. You could liken this current situation to the internet search days of pre-Google. Making content easy to find will be step one for YouTube, but then bringing in machine learning technologies to personalise will be the next stage. Some might not be convinced about personalization, but the same people would have said you can’t make money of social media networks and communities. Today’s the day you can put in your pre-order for the shiny new iPhone X and, despite the lofty price point, this seems to be the moment most Apple loyalists have been waiting for. The iPhone X is supposed to be available from 3 November – next week – but already a visit to the UK Apple store reveals that we would have to wait at least 5-6 weeks for it to turn up if we bought it today. That’s getting dangerously close to Christmas. It’s never easy to read between the lines when it comes to Apple supply constraints. On one hand its new phones are, of course, immensely popular, so such reports appear superficially plausible. However it’s not like this is a new phenomenon and Apple CEO Tim Cook is supposed to be a supply chain genius, so surely it can’t be too difficult to anticipate demand and just make sure you order enough from the manufacturers. There have been reports that certain components unique to the X are in short supply but you’d think Apple has been doing everything in its power to resolve that. And then there’s always the suspicion that Apple has a marketing interest in creating the impression of overwhelming demand exceeding even its most wildly optimistic expectations. What does seem likely, however, is that most people looking to buy an iPhone in Q4 are willing to wait for an X. Market trackers CIRP recently came up with some numbers that imply the iPhone 8 and 8+ only accounted for 16% of total US iPhone sales in Q3. This compares unfavourably to last year when the 7 and 7+ accounted for 43% of sales, implying that the majority are waiting for the X. You can see the rather cluttered CIRP chart, showing US iPhone sales share by model over the past four years, below. The key bits are the two right hand segments at the end of each bar, which signify the most recent launches. As you can see they account for a much smaller proportion this year than in previous years. It seems likely that Apple will end up shifting a ton of iPhone Xs, which should ensure its profits reach new levels of obscenity. But if this supply problem continues, and people don’t get their lovely new shiny thing until the new year, it could still turn into a bit of a Pyrrhic victory for the gadget giant. Apple has written to the SEC to ask to exclude a shareholder proposal which would essentially hardwire positive discrimination into the DNA of the business. Put forward by various institutional investors including Zevin Asset Management, Friends Fiduciary Corporation, Nathan Cummings Foundation, the Employees’ Retirement System of Rhode Island and the SEIU Fund, the proposal is to tie diversity metrics of the senior management team to the ‘company’s compensation incentive plans’. In short, CEO Tim Cook would not get his bonus is he continues to hire white males. In writing to the SEC, Apple VP of Corporate Law Gene Levoff is asking permission to ignore the proposal and to exclude it from an upcoming shareholder meeting. The argument here is current initiatives for diversity should be deemed sufficient, and writing in strictly defined parameters to the foundation of the business would have a negative impact. The team also argues it is making progress as well. 54% of recent hires are ethnic minorities, but 56% of current employees are male and 68% are white. When you look at senior executives and management, 73 of the 107 positions are white male. You can check out the rest of the numbers here. Apple is one of numerous organizations which has been singing the praises of diversity, but having a quick look through the company’s leadership team on the website, this focus doesn’t seem to be making its way up the ladder. Currently there are 19 executives listed. 14 are white and male. The company has not however committed the PR disaster of appointing a white male to the ‘Inclusion and Diversity’ VP role. On the surface, the shareholders might have a point. Most people will stick with the status quo when performance is successful, and Apple is a successful business. We don’t necessarily agree with the idea of cementing positive discrimination in the foundations of a business’ constitution, but you could argue not enough has been done to ensure diversity in the Apple boardroom. Zevin Asset Management is leading the charge for the small club of investors, which has been a long-time critic of the diversity achievements of Apple. Alongside Antonio Avian Maldonado, an individual investor, Zevin Asset Management has been particularly vocal in pressuring the iLeader to up its diversity game, seemingly falling on deaf ears for the moment. Although we were not able to figure out how much financial clout each investor holds, together all those in support of the proposal reportedly hold $9.4 billion in assets. Considering Apple currently has a market capitalization of roughly $813 billion, this is a relatively small percentage. That said, Apple investors are likely to be incredibly varied and diluted; it might be a notable number. In short, we should not be surprised Apple does not want to be held accountable to claims it has made in the press. Most large organizations scream about social trends such as inclusion and diversity as it is a good means to attract positive PR, but ask them to commit in any real sense to objective and ambitions and it will squirm and wriggle all over the place. Especially when it threatens the bonuses of the big boys. Inclusion and diversity is a great thing to shout about, but that is likely the sum of it; posturing and reinforcing the brand reputation, with no substance to actually commit to any change. Sadly, this is the world we live in: shallow and superficial. It was just like old times at Ericsson this week as a collaboration with Verizon meant it could catch up with ex alumni and reminisce about the good old days. The stated reason for getting together was to dabble in a spot of FDD Massive MIMO over Verizon’s network in Irvine, California. The dynamic duo used 16 transceiver radio units supplied by Ericsson to whack out beams from 96 antenna elements over 20 MHz of AWS spectrum. But we suspect the real reason was the opportunity for a few Ericsson execs to take Verizon Head of Networks Hans Vestberg and Verizon Chief Strategy Officer Rima Qureshi out on the piss in the name of ‘client relations’. The two had previously spent decades at Ericsson and have presumably still got loads of mates there, so what better opportunity will they have to talk about old times? Since Ericsson hasn’t exactly been shy about letting people go over the past couple of years, staying close to Verizon would seem to be a smart contingency move for any of its employees. Verizon seems to have decided the best way to be less dependent of kit vendors is to build its own mini-Ericsson so we would be surprised if Vestberg and Qureshi were the last to make that move.